From Facebook to Instagram, fashion to finance; we work with all businesses great and small to smash marketing goals and get genuine return on competition investment. Here is just a small selection of awesome results we’ve helped these small businesses to achieve by running short-term, tactical competitions and giveaways. Whilst these competitions aren’t ‘viral’ by anyone’s standards, we strive for quality leads from entrants who become paying customers rather than impressive numbers of likers who scatter when the competition closes and they don’t win. Genuine leads beat prize pigs any day! Ripple Effect Gifts' Valentine's giveaway. Valentine’s Day is the perfect opportunity to show your clients how much you love them, by running a giveaway! Ripple Effect Gifts wanted to promote their Valentines Date Night In Hampers to help their customers create memories and experiences with their loved one on Valentine’s Day. They enlisted our help to build a landing page to host their competition and assist with the competition management. We were both absolutely over the moon at attracting 464 entries in only 8 days – and at a cost of only $0.91 per email address, it’s definitely one of the most cost-efficient ways to grow your email list whilst surprising and delighting your customers! Director Miranda Gillespie wanted to celebrate Luxe.It.Fwd‘s birthday in style – by giving away an authentic pre-owned Saint Laurent handbag. She enlisted OrigamiGlobe’s help with the strategy and execution of their birthday giveaway. We set out with the aim of increasing the brand’s Instagram followers by 580 and ended up smashing that stretch goal and increasing @luxe.it.fwd‘s followers by 39% – with only 25 unfollows after the competition! See more of this competition's awesome results here. Language Lane's first ever competition. 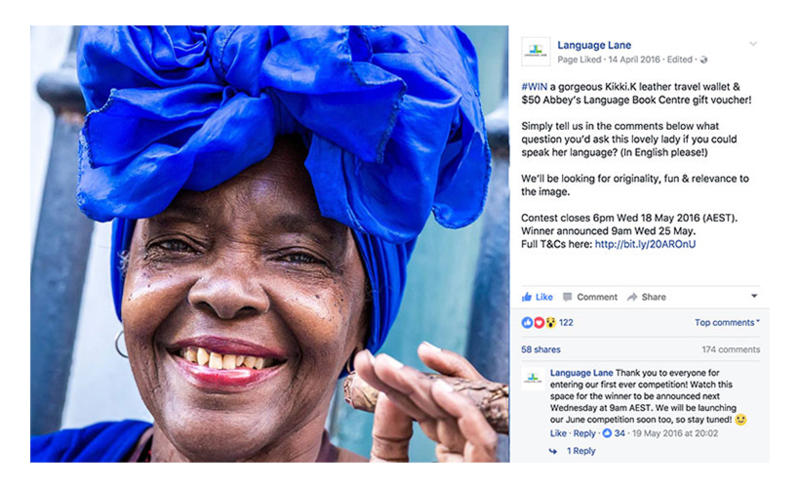 Language Lane asked us to help them run their first ever competition in the hope of growing their Facebook community and increasing engagement on their page. Together, we designed a caption-to-win competition where entrants had to post the question they would ask a local if they had the chance to travel to Cuba and meet her. The competition was a huge success in reengaging their page followers – attracting 174 entries – a fantastic response for a game of skill, which usually see around a quarter of the entries that games of chance do, due to the perceived effort involved. Revoir's second hand fashion survey. The team at Revoir designed a survey to find out more about their target audience and their second hand fashion buying habits. To incentivise their target audience to complete the survey, we worked together to create an incredibly popular giveaway. We worked hard to ensure that those who entered fit Revoir’s target demographic, so they were collecting quality information and quality leads from those most likely to turn into paying customers. Of the 930 entries, 514 chose to opt in to their mailing list – ensuring their email database is full of engaged potential customers, not those who will unsubscribe or negatively affect delivery and open rates. The Organising Platform's beautiful home package. 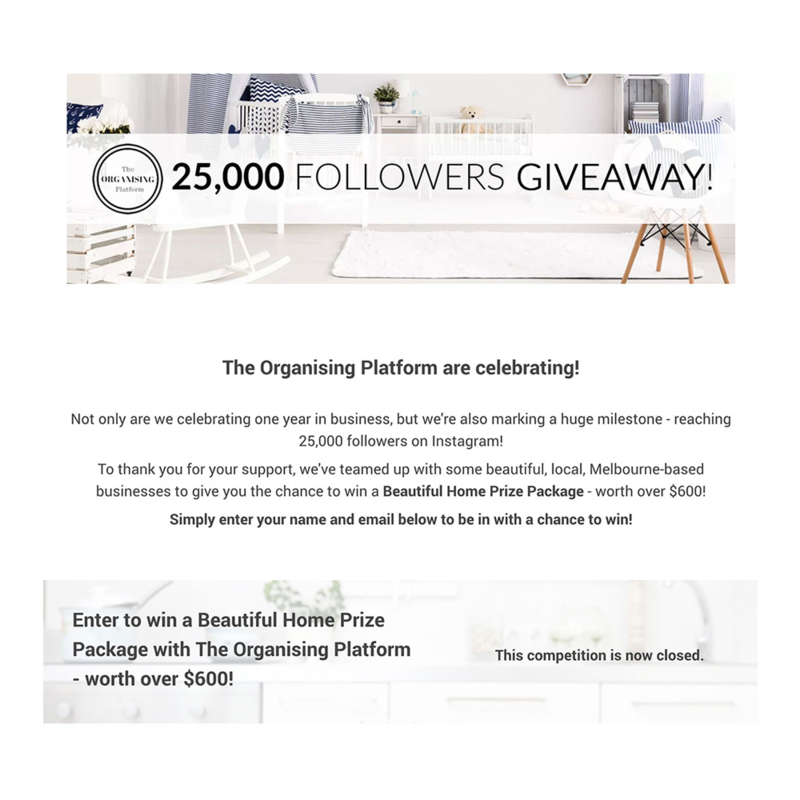 The Organising Platform are a decluttering and home organising service based in Melbourne who wanted to celebrate reaching 25,000 followers on Instagram! The aim of their competition was to thank their audience for their support and collect email addresses to start building their email list. They wanted to work with local businesses to offer a ‘beautiful home prize package’ but didn’t want to run a traditional loop competition on Instagram and so they enlisted our help. Together we created an alternative to a loop competition and created a custom competition landing page where each business contributing a fantastic prize could be showcased and entrants could enter easily and quickly without having to go to each different Instagram account and complete a number of actions. Wondering what you could achieve? Book a FREE competition chat with us! Every competition, like every business, is completely unique; so to find out what would work best for you, let’s chat about your business and marketing goals and come up with some ideas that will wow your audience and build an engaged customer base.